Welcome to “Antara’s Creativity”. I’ve been busy lately so couldn’t post regularly here. In Diwali, we got many beautiful sweet boxes & luckily all were in same size. Boxes were so beautiful & well designed that we decided to make something useful from them. We got so many creative ideas . 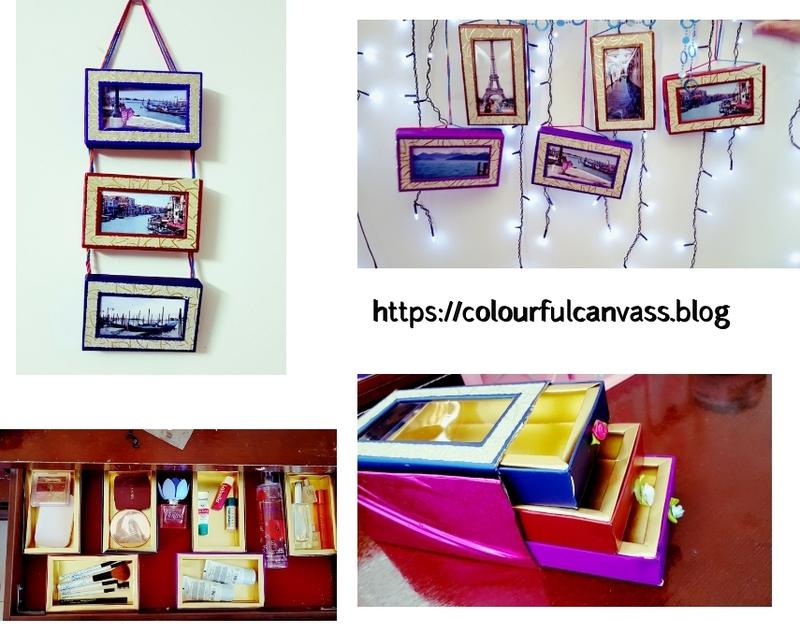 So sharing with you this quick post, Crafts ideas from sweets boxes. 1. 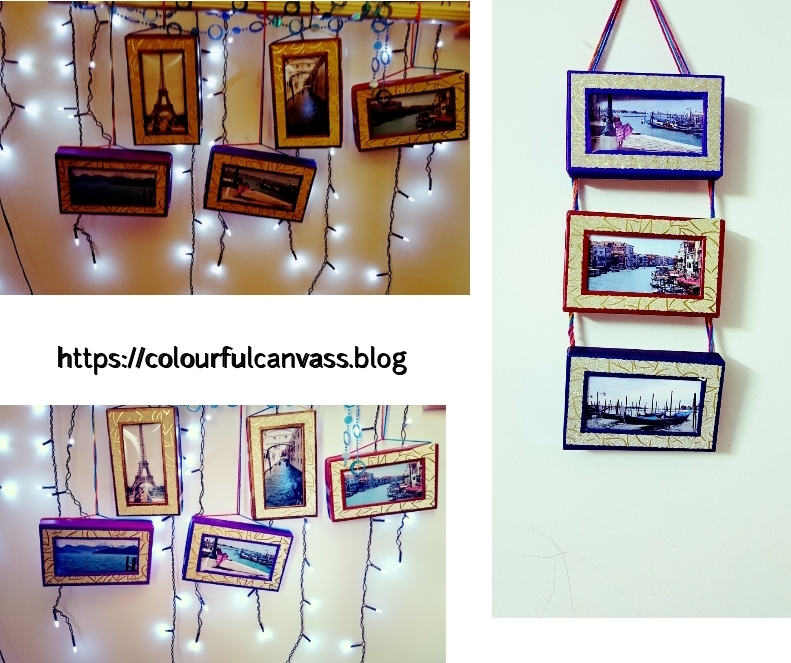 Photo Frames–Antara tried 2 types of hanging frames as shown in the pics. First one is pretty simple in second one she tried to hang pics with string lights. this is current trend, called fairy light wall “. It was not perfectly done but this added sparkle to our room. It is soothing & relaxing to watch strings of lights with pics. 2.Drawers— As we have used covers for photo frames, we are going to use boxes for making drawers. Drawers are great space saver to keep stationary & accessory. You can use your favorite wrapping paper to create your own style. Here we used boxes directly & one more big box to stack drawers exactly into it. 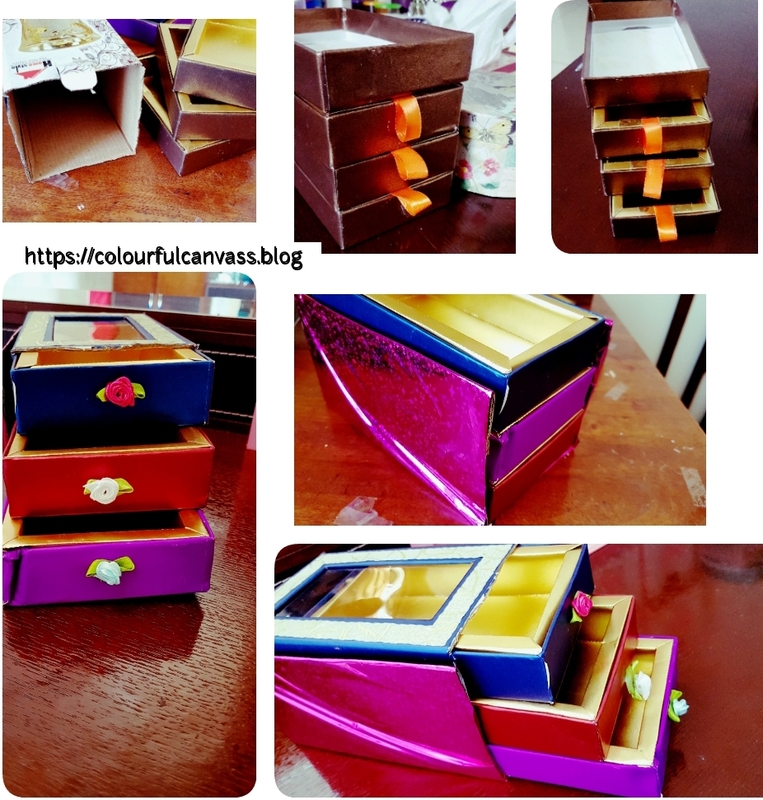 3.Jewellery box— You can use this box as jewellery box. 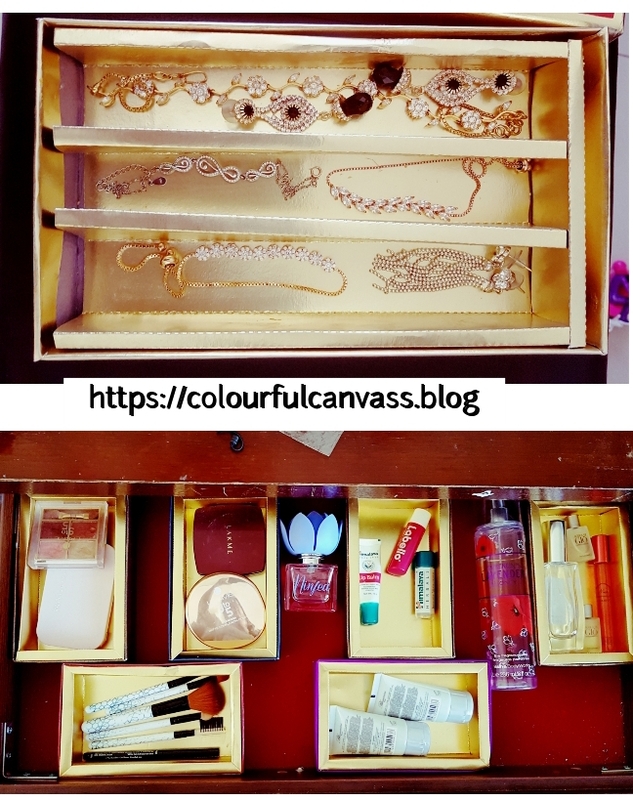 If you are looking for ear-rings & necklaces organizer, click this link for more ideas. 4.Drawer organizer/dividers– Try these boxes as drawer dividers. You can see & find everything very quickly. If you have cardboard boxes arrange them in whatever way you like. 5. 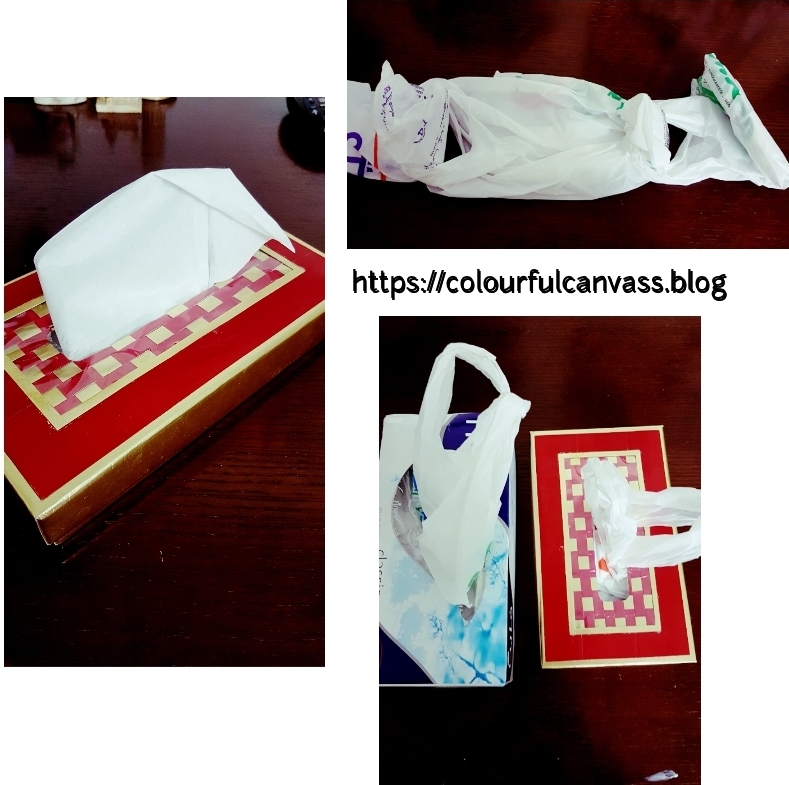 Decorative Tissue box cover –This cute boxes are an easy & inexpensive option to make tissue box cover. 6.For plastic/grocery bag cover— Plastic bags are banned/harmful but still we love keeping tons of plastic bags at home. We need it for countless reasons from throwing trash to keep expensive clothes. I guess just like me, you all are stashing all carry bags in one big bag lying around corner of the kitchen. So here this hack will work out same as tissue box. You can use empty tissue box also. Take carry bags & fold it nicely & loop them together with ends of each bag to handles of the previous bag . So friends, next time when you have similar boxes reuse them. Feel free to share your ideas too. Subscribe for more DIY & crafts ideas. Thanks for being with us & have a good day! Previous Peeking Into My Twins’ World!! Beautiful Creation. Thanks Antara for giving us such beautiful ideas. wow grt wht a creativity ! 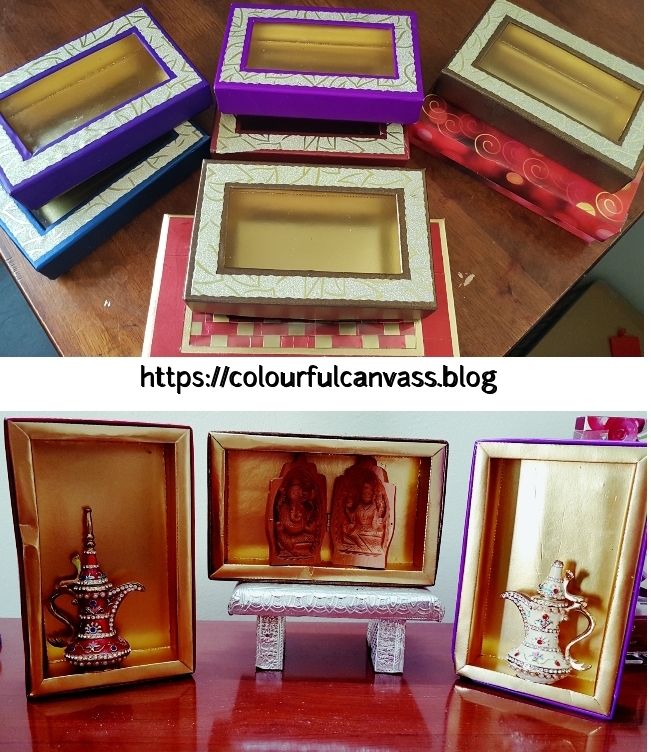 Beautiful boxes that I would love to gift to my cousins ! One to Many…Creative – beautiful reuse! Welcome Anu to Colourful Canvas. Glad you liked it. Thank you Sir. Have a great day! Awesome ideas. I like creative projects like these a lot too.